First DVD from Legendary John Kay and Steppenwolf! 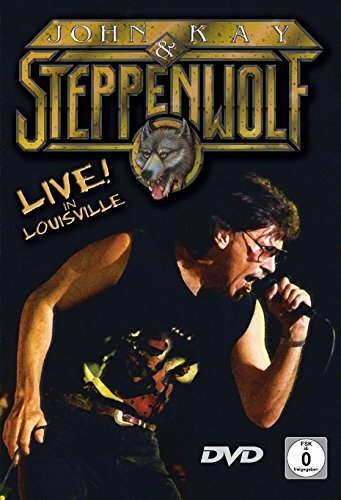 The remarkable resilience of John Kay and Steppenwolf has never been more apparent than with the release of this video from the "Live In Louisville" concert. This is the first complete John Kay and Steppenwolf performance video. While pyrotechnics light up the night, the legendary group creates fireworks of its own with a trademark sound that resonates through a crowd of loyal stalwarts and new young faces. They play all of their hits, "Magic Carpet Ride," "Sookie Sookie," "Born To Be Wild," "The Pusher," "Monster," etc. and cross all demographic barriers delivering a phenomenal performance. This particular project is a Steppenwolf milestone because it features the band members with the longest tenure in the band's 35-year history, always led by the incomparable John Kay. "Live In Louisville" shows a revolutionary band that originated in the 60's, that continues to earn new fans in the new millenium. If you have any questions about this product by DVD, contact us by completing and submitting the form below. If you are looking for a specif part number, please include it with your message.